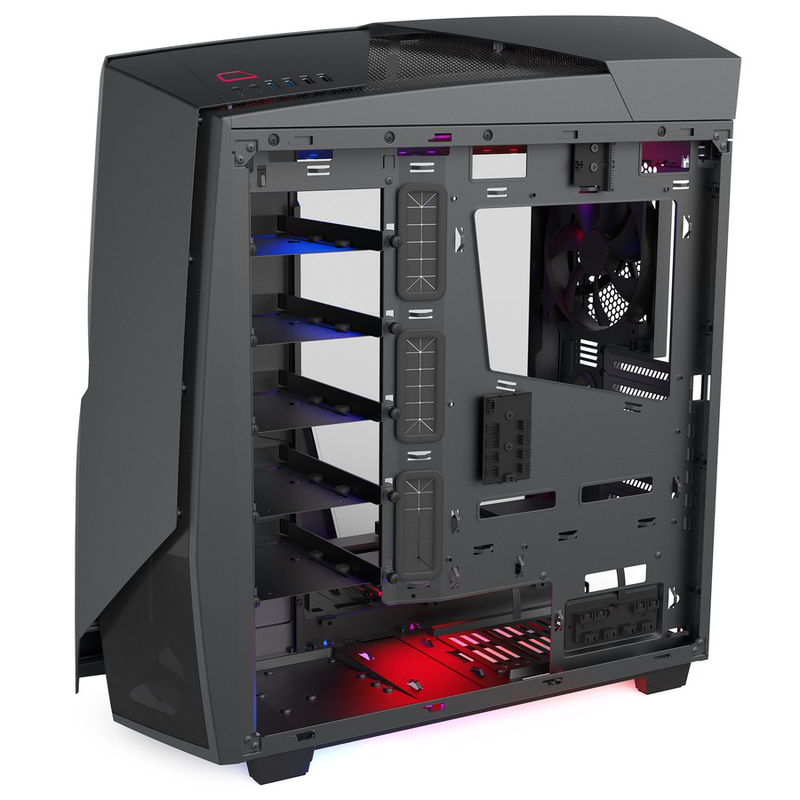 If you're a chassis manufacturer creating enthusiast towers, how do you go about making your product stand out from others? 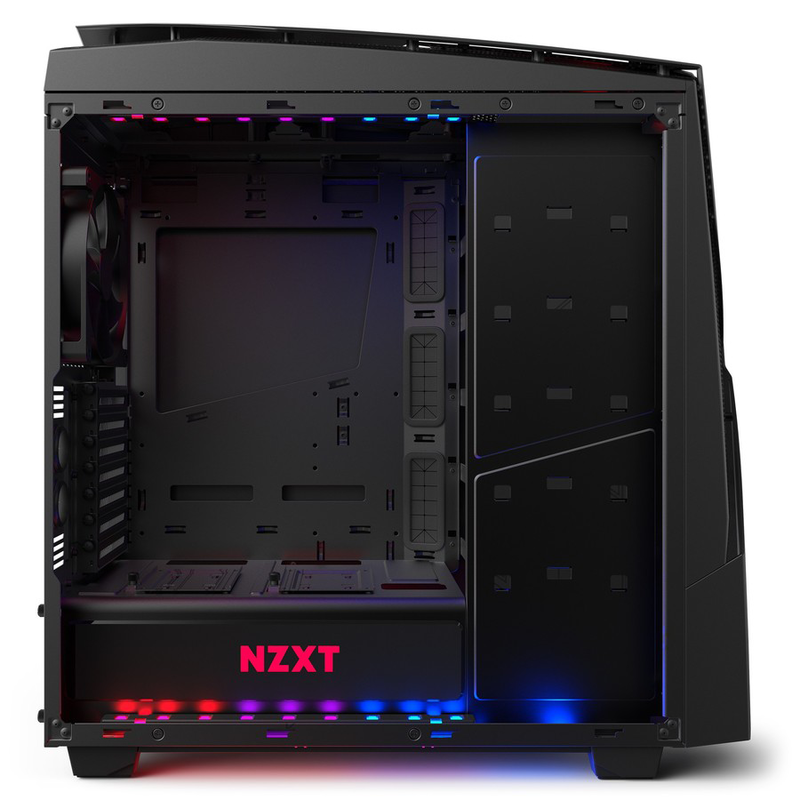 It's easier said than done in a marketplace brimming with similar-looking boxes, but NZXT is developing something of a niche by partnering with relevant manufacturers to launch limited-edition variants of existing models. 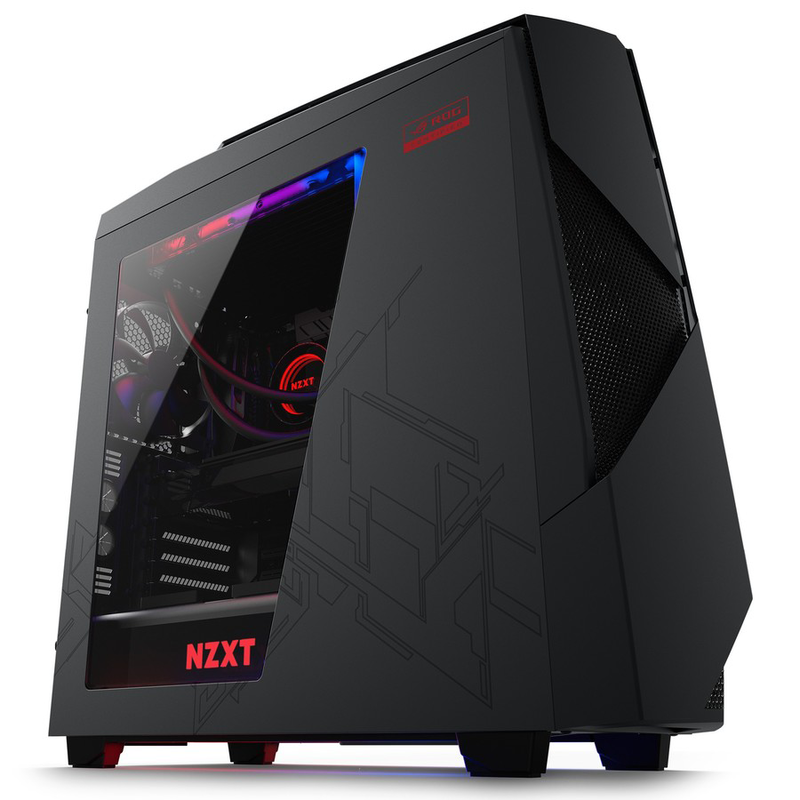 We've previously seen the firm collaborate with Razer to produce customised editions of the H440 and S340, and NZXT is now broadening its roster with the Noctis 450 ROG. Created in partnership with Asus and designed to appeal to the Republic of Gamers fanbase, this unique variant of the 2015 original comes with ROG certification and claims to have been created "for truly dedicated PC gamers." There's obviously going to be a fair amount of marketing hyperbole to look past, so what does the Noctis 450 ROG actually bring to the table? Well, from a construction point of view, the chassis is practically identical to the model launched in April 2015. It's technically a mid-tower solution, but the plastic accents on the front and top result in overall dimensions of 220mm x 567mm x 544mm, which isn't far off full-tower proportions. 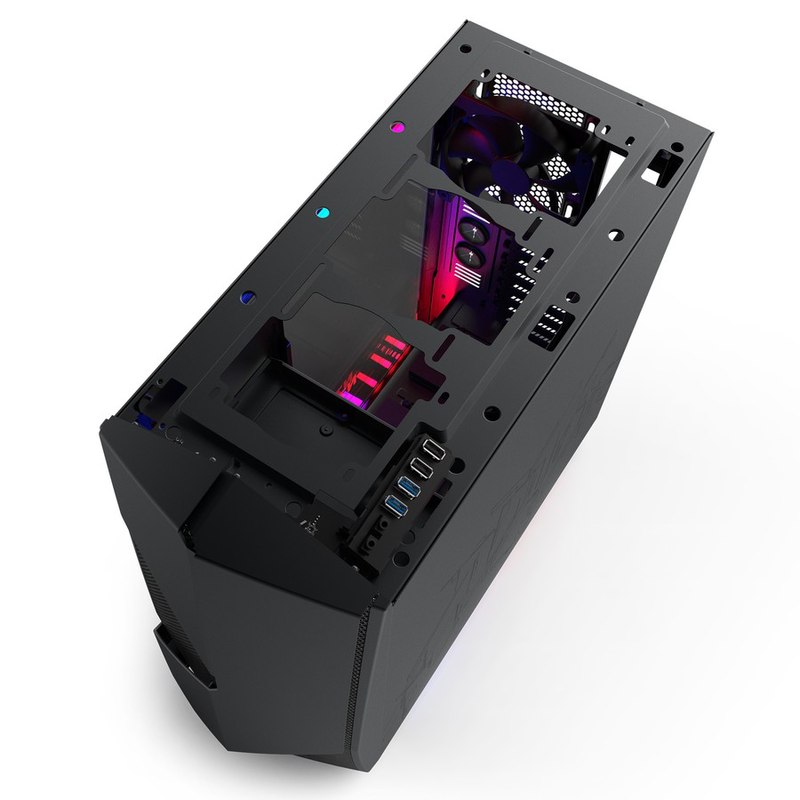 Considering the size and the somewhat dated angular appearance, we're surprised that Asus and NZXT have chosen this particular case for the ROG makeover. As part of the customisation, the exterior has been painted in matte grey and adorned with a quirky pattern on both side panels. The real party trick, as you might have guessed, is the addition of RGB lighting designed to synchronise with an Asus Aura-certified motherboard via a single four-pin connector. 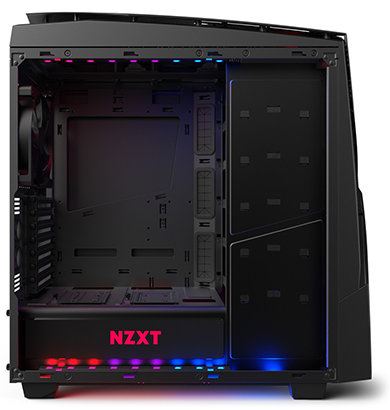 The RGB illumination is comprised two internal LED strips, the backlit power button, an underglow and the PSU shroud. All of these can be controlled via Aura Sync, opening up the possibility of effect synchronisation with, say, a couple of Aura-enabled graphics cards. Not yet rocking an Aura-certified motherboard? Not to worry, there's a Molex convertor in the bundle that allows all the lights to be powered by the PSU, though do be aware you are limited to a single colour (red) if you choose to take this path. A splash of paint and a sprinkling of lights is, in a nutshell, what the ROG customisation brings to the table. 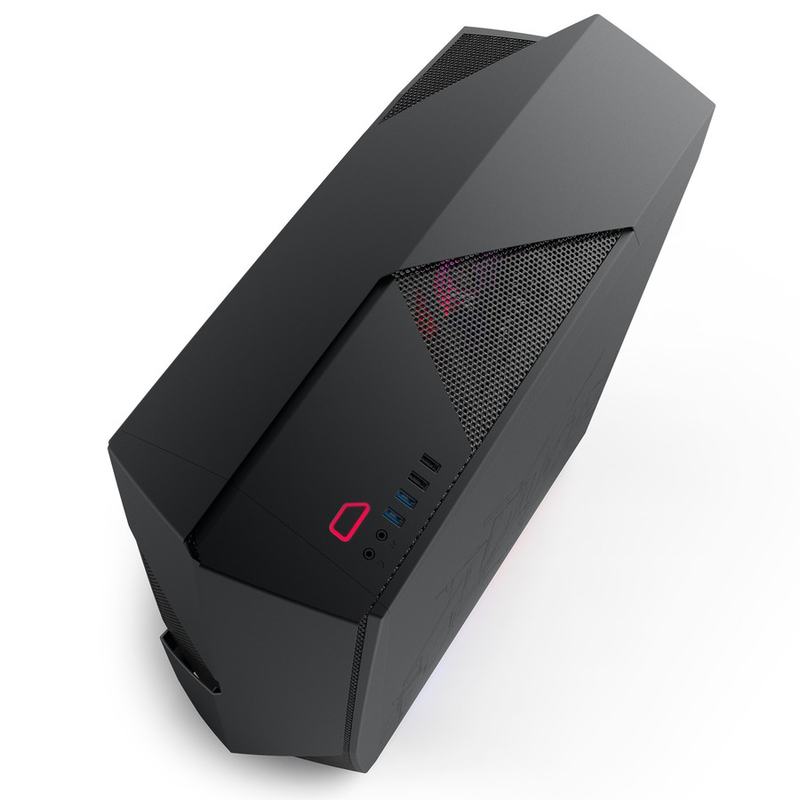 We like the fact that the case looks unique, and the illumination will appeal to gamers who have bought-in to the Aura ecosystem, but there is an obvious downside to be aware of. 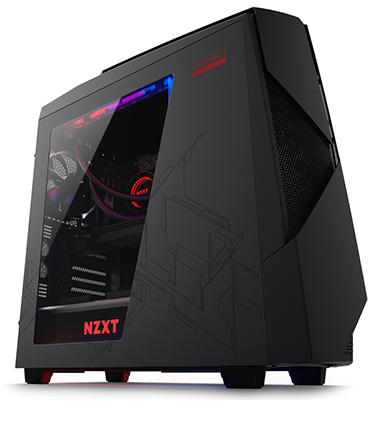 At the time of writing, the Noctis 450 ROG fetches a whopping £180 at retail. 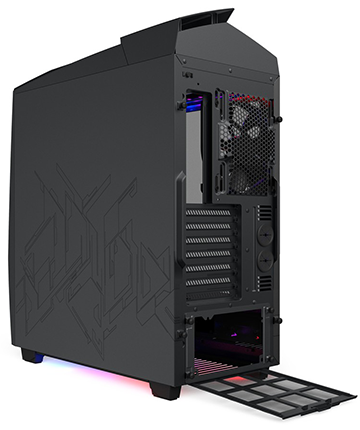 That's a hefty amount for a case whose inner layout dates back to early 2015, but what makes the ROG model even harder to justify is that the standard Noctis 450 is available for £105. You'll need to be madly in love with the paintwork in order to consider forking out a 70 per cent premium. 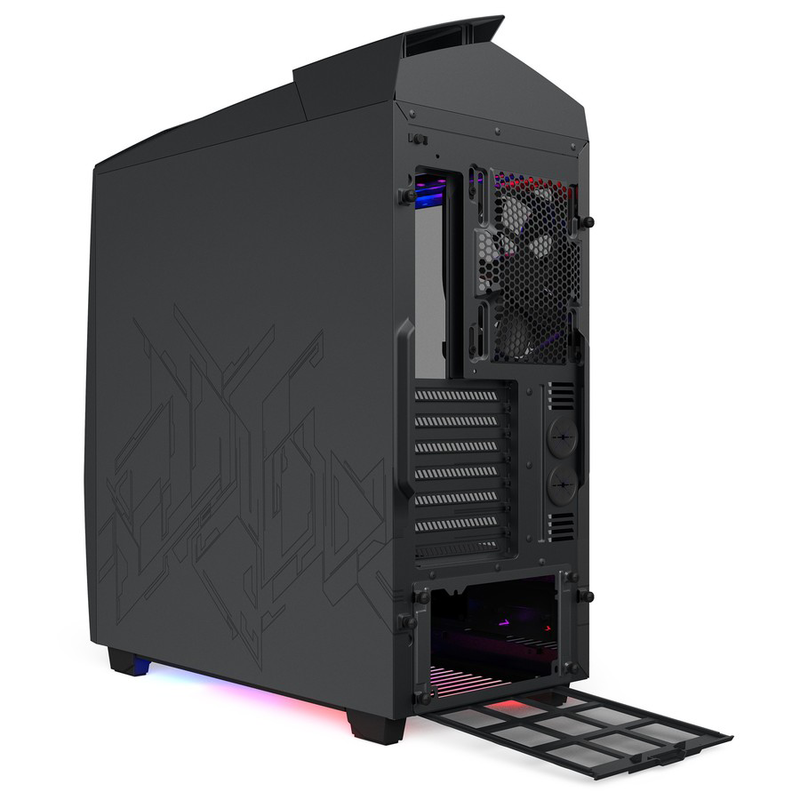 Start to build into the Noctis 450 ROG and you begin to realise why cases from just a few years ago don't necessarily conform to modern expectations. Despite the massive dimensions, the interior doesn't feel particularly roomy due to a dedicated storage column that allows for up to six 2.5/3.5in drives. 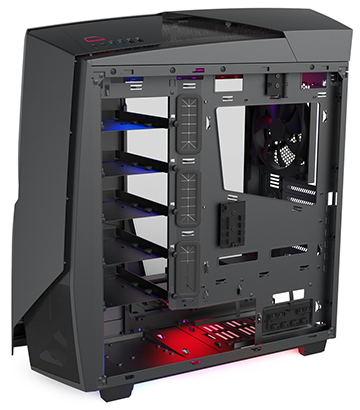 The right-sided column is admittedly well-built, with metal trays held in place by thumb screws, but are RGB-loving gamers going to be equipping their prized rig with half-a-dozen mechanical hard disks? We're not so sure. The pair of 2.5in trays sat atop the PSU shroud make a lot more sense, but it is a surprise for a case of this size to have multiple 2.5/3.5in bays yet not a single 5.25in. On the other hand, there's plenty of cooling potential. Four fans are included as standard; three 120mm FN v2 front intakes; and a single 140mm FN v2 rear exhaust. If that doesn't cut it, the top plastic section comes away to reveal room for three further 120s or a couple of 140s. 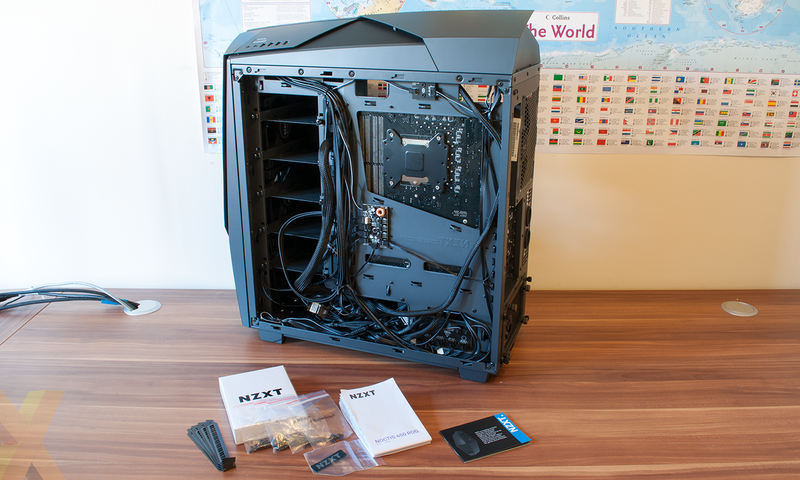 What's handy is that all four of the supplied fans are attached to an integrated eight-way hub that connects to a single PWM header on your motherboard. Said hub does a great job of keeping things quiet, but it does add an extra layer of cable clutter and it's frustrating that power is sourced via Molex as opposed to SATA. If cables are a concern, be aware that the multiple RGB lights attach to another six-way hub fixed to the side of the PSU bay. Making it all tidy can be a challenge, and though there's a decent amount of cable clearance (32.5mm), the notched side panels aren't the easiest to reattach. Elsewhere, CPU cooler clearance is measured as 180mm, while graphics cards can run up to 294mm in length, or 406mm provided you remove a drive tray or two. From a compatibility point of view, this is the Noctis 450 as know it, and that means the I/O panel still rocks dual audio jacks and four USB ports (2x 2.0, 2x 3.0) alongside the power button, but there's no love for USB Type-C and, indeed, no reset button.